For the past 17 years we have been capturing LIDAR (Light Detection & Ranging) data in England. LIDAR uses a laser to scan and map the landscape from above and is widely considered to be the best method for collecting very dense and accurate elevation data across the landscape. 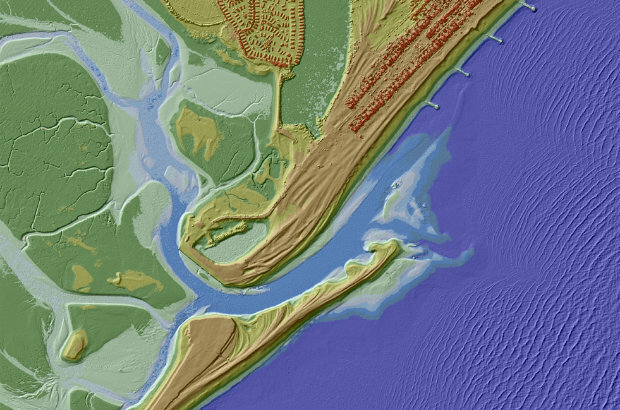 We use LIDAR to help the work of the Environment Agency in many ways, including creating flood models, assessing coastal change and analysing how land is used. We now have an extensive archive of aerial LIDAR data covering nearly three quarters (72%) of England – the data mainly covers flood plains, coastal zones and urban areas. As technology has improved and costs have fallen, LIDAR data is now being used by just about everybody who works with maps. From local planners to archaeologists, farmers to ecologists, LIDAR data can inform their work. In 2013, we made the data available for free for the first time for non-commercial use to anybody who wanted it. In that time more than one million km2 of data has been downloaded. Following the Winter Floods 2014, we committed to ensuring our information is available, by publishing as much of it as possible as Open Data – free of charge and restrictions. From September 2015 all our LIDAR data will become Open Data and everyone will be able to use it for free. We are releasing two LIDAR products under the Open Government Licence and you will be able to access these through Datashare. The full tiled dataset consists of historic LIDAR data which has been gathered since 1998. For some areas we have carried out repeat surveys and data is available in a range of resolutions. The composite dataset is derived from a combination of our full tiled dataset which has been merged and re-sampled to give the best possible spatial coverage. By making the LIDAR data open to all, users will be able to access it free of charge, even for commercial use. We hope that by removing any cost barriers, our data will improve the quality of flood risk modelling used by businesses and local communities and allow for the development of innovative tools and techniques to further benefit the environment. Dr Alison Matthew is Geomatics Manager at the Environment Agency. She has over 25 years experience working in operational remote sensing. A good step forward in sharing content to everyone and driving development. Excellent news! Will both the surface and terrain models be made available? Thanks Eileen. The geomatics portal link isn't quite right. I think you meant http://www.geomatics-group.co.uk. Is it only English data that's being released? If so- why? And when might data for the rest of the UK be made available? You are setting the bar high for others to follow. Let us hope they accept the challenge. Free technology is the way to engage and motivate the smaller organisations among us. Hi, in the email I just received about this excellent news and also above, am I correct to assume that this free availability is for England only and that other parts of the UK are excluded? Is the data going to be available for commercial use? If so will it be free of charge? Thanks - great to hear of its use for archaeology! Will the ASCII files ,DTM + DSM be available please.? Will data be available for Wales as well? Thanks so much for helping the government to increase UK productivity in the wider economy. Is LiDAR data available on datashare? Hi, I'm trying to find the right files to download to use in MapInfo - which datasets should I choose? Everything I go for seems to be line data. Thanks. Exciting news, and I look forward to making use of it. When it arrives! As of 13.30GMT today there's still no sign of anything on Datashare, Geomatics or anywhere in data.gov.uk to point towards any actual open data. Please release the raw LiDAR pointcloud as well. The Dutch govt did that and it's led to a couple of great projects and products by 3rd parties already. Encouraging news. Were you aware that in a couple of weeks (14-17 Sept 2015), a new standards working group is being convened at the Open Geospatial Consortium Technical Conference, held at BGS HQ in Keyworth, Nottinghamshire? One intent is to agree global interoperability standard(s) for Lidar data in conjunction with ASPRS [http://www.asprs.org ]. See [http://www.opengeospatial.org/projects/groups/pointclouddwg ]. Interested parties can join the e-mail list at: [lists.opengeospatial.org/mailman/listinfo/pointcloud.dwg ] . I think there should be more representation from the Open Data community. Still no sign of a working site. Any news on what is going on and an etc when the service will be up and running? Hi Ian, Sorry to hear you are having difficulties accessing the site. Would you be able to tell us the URL address of the site that you are trying to access so we can see how we can help further. Both the Datashare http://www.geostore.com/environment-agency/WebStore?xml=environment-agency/xml/index_public.xml and the geomatic website https://www.geomatics-group.co.uk/geocms/ seem to be working OK. Both of these pages don't work for me, I get nothing showing up no map interface. The odd thing is it works on my iPhone, but I cannot download anything. The terms and conditions say we can't use this for commercial purposes. Is this correct? Having data freely provided is great, however the other element is being able to see and use it on a productive basis for small flood evaluation projects, down to a single house domestic use. To afford maximum advantage both to the public and small businesses who cannot afford the expensive flood modelling programmes, is there advice on compatibility with the main international free open source GIS programmes - such as Mapwindow? A problem is you cannot limit the area wanted to a single grid section, instead you get 100MB of an entire area such as SP20. Is the idea that you the delete the sections outside the area interested manually or am I missing something? Great news for amateur archaeology groups such as the one I belong to. Is there any particular software program needed to open and view downloaded files please? Hi, to echo Bharadwaj;s comment above, its there any document or file available that would give an indication of coverage extent? Can the ASC Files be opened in AutoCAD 2015 (not Civils 3D). Or will they have to be converted first? I can't seem to find a way to view/import/open or convert them using CAD. Thanks. I am experiencing the same problem, trying to import lidar data into AutoCAD Map 3d 2016 though the Re Cap 2016. I couldn't find the answer in the FAQ. Have you solved the problem? Which geoid model (height reference) has been used for the LIDAR data ? Hi there, is there any way of acquiring the metadata associated with the LiDAR data, i.e. what time it was flown, the vertical accuracy, etc. Hello. Are you able to say when the datashare website will be up and running? Hello, is there similar data for Scotland also available ? This data is fun to play with - thank you! Are you likely to be filling in the gaps where there is, at present, no data? If so, is there a schedule or plan for this? I thought that might be the case! Thanks anyway for taking the time to reply. Is there a way to know when the Lidar data was updated, or when the survey was done? To find out the date the LIDAR survey was flown click on the ? next to the dataset you downloaded from http://environment.data.gov.uk/ds/survey#/download. Then select the second “resource locator”, from where you can download a shapefile containing that information. It's great that this is now open data. I can view the data at work as we have ArcGIS but wish to advise the amateur archaeology groups I work with how they can view the data if they don’t have GIS software. So: is Flickr the ONLY way to view the data if you don't have specialist software? I've seen the answer above "For more information on our LIDAR data and how to open it, please download the FAQ, which can be found on the LIDAR download page at http://environment.data.gov.uk/ds/survey#/download&quot; and have read this document but would just like verification. Hi, the page you mention should include a link to a list of open source GIS tools that you may find helpful http://environment.data.gov.uk/ds/survey#/download. What reason did you have for the low-flying aircraft over The Holme Valley in West Yorkshire last night? As the Environment Agency’s remote sensing team it is our job to capture aerial survey data of England, which is used for flood risk mapping. 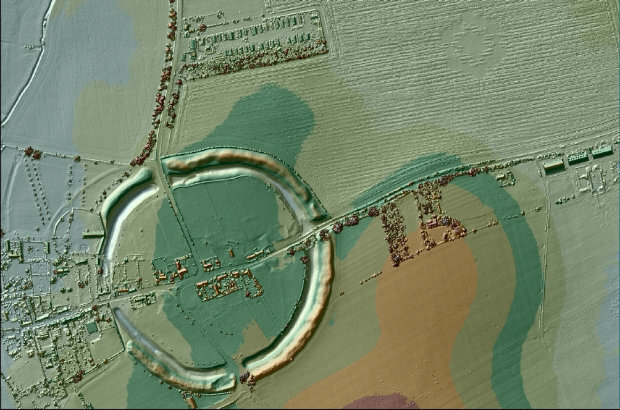 Every year we survey thousands of square kilometres of England using LIDAR to produce detailed digital height models. The locations we survey are chosen based upon which areas are most at risk or where the greatest need is for up to date topographical data. Unfortunately due to operational constraints, many of our aerial surveys have to be conducted from an altitude of approximately 2,500ft above ground level and often at night. The altitude is much lower than a passenger jet, but is not as low as typical police or military flying. Unfortunately after some extensive testing downloading a series of grids in order to produce a pointcloud I have found that the tile that is expected doesn't arrive, Instead I am getting files that are of a totally separate location. I have tried to download the TQ37 grid (which is shown over the Farringdon area). However once processed the Crystal palace park appears. I would of assumed that grid coding would correspond with OS grid system but they are entirely different to the grids shown the ordnance survey. Could you get someone to contact me in order to get the bottom of these issues? We have been experiencing some problems with the download site in the last few days, it should be fixed now. I seem to have found a discrepancy between LIDAR data and the OS spot heights. At East 331053 North 431900 there is an OS spot level on a carriageway centreline of 7.6. The LIDAR data gives levels in excess of 8.5m for some distance in any direction. Nearby levels in OS and old OS shhets seem to bear out that 7.6 is in the right ballpark. Has the wrong file downloaded please? The file is SD3131_DTM_2M.ASC. I have checked against spot heights nearby in the same 1k square and have found other discrepancies - suggesting the wrong file? I am using a small in-house program specifically written to extract values for a small area to a csv file and have not had any problem at all in the past. Hi Keith, Please can you contact us directly at geomatics_data@environment-agency.gov.uk. We require more information from you in order to be able to look into this discrepancy. Have you got a policy explaining which parts of the UK you are choosing to overfly and scan. Is there any chance it could extend a few metres up the slopes of the valleys to the caving/karst regions of North Yorkshire and the Mendips (Somerset) where all the cave entrances are found? We are relating the few Lidar scans where they have strayed into the right areas (such as on Fountains Fell north of Settle), but it would be awfully nice if it could take in the rest of the important areas. You probably don't take requests, but caves are arguably hydrological features where the water is flowing in tunnels instead of visible river valleys. We could do something about filling you in with data on the known main drains that could be included in the flood models. We are in the process of relating our detailed cave surveys of the biggest systems (now online here http://cave-registry.org.uk/ ) having just discovered these lidars and QGIS, so it's interesting times. Why does the link to "Datashare" say it'll be back up and running in August 2017? It's March 2019.